-Yogi Berra in a telegram to Johnny Bench after Bench broke Berra’s record for most home runs as a catcher. We recently explained why the Dow Jones Industrial Average is a terrible, no good, very bad index. In spite of our best efforts, media outlets still refuse to let go of treating “the Dow” as a proxy for the stock market. As a result, headlines in each of the past twelve business days (as of February 27, 2017) have reported that “the stock market set a new all-time high today”. Not to be left out, the S&P 500 Index has closed at an all-time high on twelve trading days since the start of the year. Barely a week has passed since mid-November where the stock market (however you want to define it) did not achieve a new all-time high. 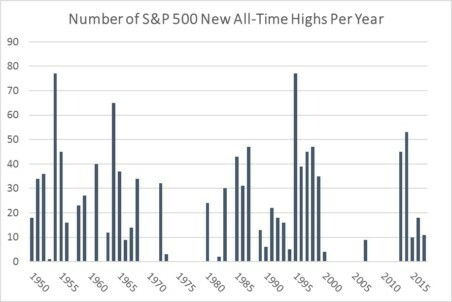 What should we make of these regularly occurring new all-time market highs? For some, the natural reaction is to conclude that because stocks are at an all-time high, they must be frothy or overpriced and due for a correction. Sit patient on the sidelines and wait until there is a better entry point, such thinking might go. But should that be the conclusion we draw from the consistent headlines? Does the fact that stocks are at or near an all-time high mean that it is a bad time to invest in stocks? Let’s start with this: the S&P 500 Index has closed at an all-time high on 6.9% of all days since 1950. More tellingly, the index has been within 5% of its all-time high on 46% of all trading days since 1950. This is to say that over its history, the US stock market trades at or near an all-time high roughly half the time. 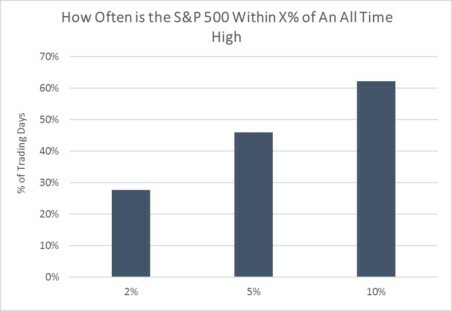 Consider further that during the 1990’s – a decade in which stocks averaged an annual return of 19.0% per year – the stock market (S&P 500) was within 5% of its all-time high on more than 80% of all days. For nearly all of the greatest bull market in history, stocks consistently traded near record highs. Should I Invest When the Stock Market is Near a Record High? Let’s assume for a moment that an investor avoided stocks when the S&P 500 was near its all-time high. If the Index closed within 5% of its all-time high, this investor unfailingly sold all stocks and waited to reinvest until the market was more than 5% below its all-time high. 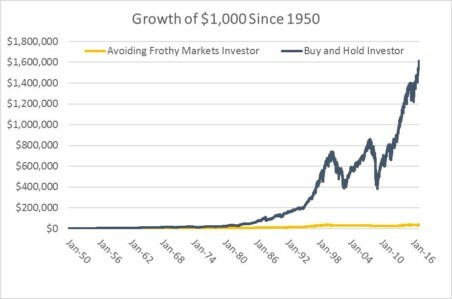 Our “avoiding frothy markets” investor would have profited handsomely – turning $1,000 into $41,946 over the stretch from 1950 through the close on February 27, 2017. In fairness, this return would have been dramatically reduced by high transaction costs and taxes when going in and out of the market. But we give the simplistic benefit of free trades and no taxes which means $1,000 gets turned into $41,946. Such a return may sound enticing until you consider that had this investor simply stayed invested during this entire stretch, he or she would have turned the same $1,000 into $1,615,398 (and faced dramatically lower transaction costs and taxes). Here is some news: all of my kids are at their record heights today. They set a similar record height the day before and the day before that. Does this mean that they are all tall? Does this imply that they are likely to stop growing soon? To make an assessment about whether my kids are tall or likely to stop growing soon, it is far more instructive to know their height relative to their classmates or relative to their parents. The same can be said for stocks. Knowing how stocks are priced historically relative to some metric like earnings or cash flows is far more instructive than knowing whether stocks are at an all time high or not (we’ve addressed the predictive utility of stock valuations in several posts, including here and here). The reality is that stocks at an all-time can high can be cheap, fairly priced, or expensive. History has shown many examples of all three environments. Said differently, the conclusion to draw when stocks are at or near an all-time high is not that stocks are frothy, expensive, or likely to correct. The conclusion to draw is that they are at or near an all-time high.